For the UK rock group, see Cinerama (band). The Cinerama projection screen, rather than being a continuous surface like most screens, is made of hundreds of individual vertical strips of standard perforated screen material, each about 7⁄8 inch (~22 mm) wide, with each strip angled to face the audience, so as to prevent light scattered from one end of the deeply curved screen from reflecting across the screen and washing out the image on the opposite end. The display is accompanied by a high-quality, seven-track discrete, directional, surround-sound system. The original system involved shooting with three synchronized cameras sharing a single shutter. This process was later abandoned in favor of a system using a single camera and 70mm prints. The latter system lost the 146° field of view of the original three-strip system and the resolution was markedly lower. Three-strip Cinerama did not use anamorphic lenses, although two of the systems used to produce the 70mm prints (Ultra Panavision 70 and Super Technirama 70) did employ anamorphics. Later, 35mm anamorphic reduction prints were produced for exhibition in theatres with anamorphic CinemaScope-compatible projection lenses. Cinerama was invented by Fred Waller (1886–1954) and languished in the laboratory for several years before Waller, joined by Hazard "Buzz " Reeves, brought it to the attention of Lowell Thomas who, first with Mike Todd and later Merian C. Cooper, produced a commercially viable demonstration of Cinerama which opened on Broadway on September 30, 1952. The film, titled This is Cinerama, was received with enthusiasm. It was the outgrowth of many years of development. A forerunner was the triple-screen final sequence in the silent Napoléon made in 1927 by Abel Gance; Gance's classic was considered lost in the 1950s, however, known of only by hearsay, and Waller could not have actually seen it. Waller had earlier developed an 11-projector system called "Vitarama" at the Petroleum Industry exhibit in the 1939 New York World's Fair. A five-camera version, the Waller Gunnery Trainer, was used during the Second World War. The photographic system used three interlocked 35 mm cameras equipped with 27 mm lenses, approximately the focal length of the human eye. Each camera photographed one third of the picture shooting in a crisscross pattern, the right camera shooting the left part of the image, the left camera shooting the right part of the image and the center camera shooting straight ahead. The three cameras were mounted as one unit, set at 48 degrees to each other. A single rotating shutter in front of the three lenses assured simultaneous exposure on each of the films. The three angled cameras photographed an image that was not only three times as wide as a standard film but covered 146 degrees of arc, close to the human field of vision, including peripheral vision. The image was photographed six sprocket holes high, rather than the usual four used in other 35 mm processes. The picture was photographed and projected at 26 frames per second rather than the usual 24. In addition to the visual impact of the image, Cinerama was one of the first processes to use multitrack magnetic sound. The system, developed by Hazard E. Reeves, one of the Cinerama investors, played back from a full coated 35 mm magnetic film with seven tracks of sound (five behind the screen, two on the side and back of the auditorium with a sound engineer directing the sound between the surround speakers according to a script). The projectors and sound system were synchronized by a system using selsyn motors. The Cooper Theatre in Denver, Colorado. The third super-Cinerama, the Indian Hills Theater, was built in Omaha, Nebraska. The Indian Hills theater closed on September 28, 2000 as a result of the bankruptcy of Carmike Cinemas, and the final film presented was the rap music-drama Turn It Up. The theater was demolished on August 20, 2001. 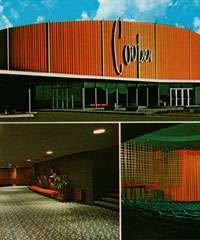 Venues outside the USA included the Regent Plaza cinema in Melbourne, Australia, which was adapted for Cinerama in 1960 to show This is Cinerama and Seven Wonders of the World. The Imperial Theatre in Montreal and the Glendale in Toronto were the Canadian homes for Cinerama. This is Cinerama received its London premiere on 30th September 1954 at the Casino Cinerama Theatre, Old Compton Street, formerly a live theatre. The film ran for 16 months and was followed by the other three strip travelogues. How the West Was Won had its World Premiere at the Casino on 1st November 1962 and ran until April 1965 after which the Casino switched to 70mm single lens Cinerama. London had two other three strip venues, making it the only city in the world with three Cinerama theatres. These were the Coliseum Cinerama, from July 1963 and the Royalty Cinerama from November 1963, like the Casino both converted live venues. The Coliseum played only one film in three strip (The Wonderful World of the Brothers Grimm) before switching to 70mm single lens from December 1963, and the Royalty had two runs of Brothers Grimm separated by a run of The Best of Cinerama before also switching to 70mm single lens in mid 1964. These London venues were directly operated by Cinerama themselves, elsewhere in the UK three strip Cinerama venues were operated by the two main UK circuits, ABC at ABC Bristol Road, Birmingham and Coliseum, Glasgow, Rank at Gaumont, Birmingham and Queens, Newcastle and by independents at the Park Hall, Cardiff, Theatre Royal, Manchester and Abbey, Liverpool. Most of these conversions of existing cinemas came just as Cinerama was switching to single lens and thus had short lives as three strip venues before switching to 70mm. The less wide but still spectacular Super Panavision 70 was used to film the Cinerama presentations Grand Prix (1966), 2001: A Space Odyssey (1968) (which also featured scenes shot in Todd-AO and MCS-70), Ice Station Zebra (1968) and Krakatoa, East of Java (1969) (which also featured scenes shot in Todd-AO). 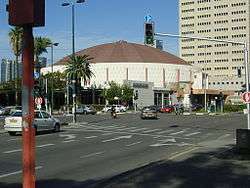 Pacific Theatres’ Cinerama Dome in Hollywood beginning in 2002. As of 2015, the Pictureville Cinema, Seattle Cinerama and Cinerama Dome continue to hold periodic screenings of three-projector Cinerama movies. The Cinerama Dome was designed for the three-projector system but never actually had it installed until recent years as it opened with the first of the single film 70 mm Cinerama films, It's a Mad, Mad, Mad, Mad World. A 2003 documentary, Cinerama Adventure, took a look back at the history of the Cinerama process, as well as digitally recreating the Cinerama experience via clips of true Cinerama films (using transfers from original Cinerama prints). And Turner Entertainment (via Warner Bros.) has struck new Cinerama prints of How the West Was Won for exhibition in true Cinerama theatres around the world. Cinerama established the standard for all of the large screen formats that followed. Its successors, Todd-AO, CinemaScope, and the various 70 mm formats, all attempted to equal or surpass its grandeur while avoiding its problems to greater or lesser degrees of success. In movie theaters today the large format IMAX system continues the tradition, although the screen is taller and often less wide. In 2008 a Blu-ray Disc of How The West Was Won was released, offering a recreation of Cinerama for home viewing. The three Cinerama images were digitally stitched together so that the resulting image does not have the visible seams of older versions. Furthermore, as a second viewing option, 3D mapping technology was used to produce an image that approximates the curved screen, called "SmileBox". On January 14, 2012, an original Cinerama camera was used to film a sequence at the Lasky Demille Barn, the original home to Famous Players Lasky, later to be renamed Paramount Pictures. This was the first film photographed in the Cinerama process in almost 50 years. This sequence is part of a new 12-minute production filmed entirely in the three panel process. The new film, In the Picture, was presented at a Cinerama festival at the Cinerama Dome in Hollywood, California on September 30, 2012. All but two of the feature-length films produced using the original three-strip Cinerama process were travelogues or episodic documentaries such as This Is Cinerama (1952), the first film shot in Cinerama. Other travelogues presented in Cinerama were Cinerama Holiday (1955), Seven Wonders of the World (1955), Search for Paradise (1957) and South Seas Adventure (1958). There was also one commercial short, Renault Dauphin (1960). ↑ "Cinerama". www.widescreenmuseum.com. Retrieved 12 November 2009. 1 2 Hart, Martin B. "Cinerama". The American WideScreen Museum. Retrieved 6 October 2012. 1 2 Dempewolff, Richard F. (Aug 1952). "Movies on a Curved Screen Wrap You in Action". Popular Mechanics. 98 (2): 120–124+. ISSN 0032-4558. Retrieved 6 October 2012. ↑ How Cinerama Got Its Name – The True Story! ↑ Martin Hart, The American Widescreen Museum website. ↑ "cooper". Cinerama.topcities.com. Retrieved 2013-02-13. ↑ "Scottsdale Remembers - Recollections of Our Past". Retrieved July 23, 2015. ↑ "Regent Theatre Melbourne". Whitehat.com.au. Archived from the original on 2013-01-29. Retrieved 2013-02-13. ↑ Keith Phipps (November 11, 2008). "Imagine Seeing John Wayne in IMAX; That's sort of what watching How the West Was Won is like". Slate Magazine. ↑ "Cinerama Wing 6". Widescreen Museum. Retrieved 2013-02-13. ↑ "The Ultra Panavision Wing". Widescreen Museum. 1953-04-27. Retrieved 2013-02-13.